What makes the program unique is the involvement of the Parish members. Working with the DLC, the Parish created a parish-based Adult ESL Class. The Parish provided instructional space, and parish volunteers offered their time to serve as tutors, while the Dominican Learning Center trained the tutors and provided instructional materials. The St. Mary Magdalene/St. 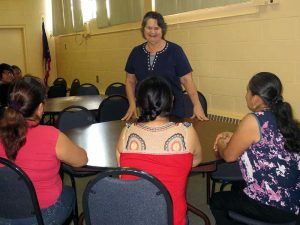 Agnes Parish has been operating their Adult ESL Class for about a year, thanks to a generous grant from the Columbus Catholic Foundation. The Dominican Learning Center also offers an Adult ESL Class in cooperation with Christ the King Parish on the east side of the city, and will open a northwest location in cooperation with St. Peter’s Parish later this year.